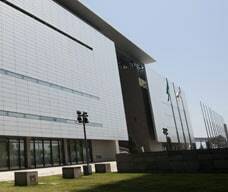 The Macao Museum of Art is the only art museum in Macao and provides the largest space dedicated to visual arts. 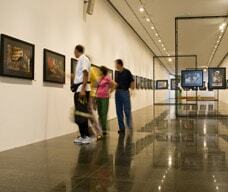 There are 5 floors in the Museum with seven different exhibition galleries. 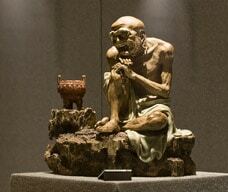 The Gallery of Chinese Calligraphy and Paintings and Gallery of Chinese Ceramics are located on the fourth floor, where mainly Chinese Calligraphy, Paintings, and Shiwan Ceramics from Canton are exhibited. On the second and third floors there are galleries for temporary exhibitions which has on display various artist's collections from Macao and around the world. The Gallery of Historical Pictures is also located on the third floor, including the export-orientated Western paintings and European prints of Macao's scenery by Chinese and Western painters. The auditorium is located on the first floor with the capacity to seat more than 100 people. It is equipped for video projections and slides and various seminars are regularly organised for the public. The Museum has a library with many art-related books and allows use of the audio facilities and internet services for free. The library is also equipped with visual facilities where the public can choose from over 400 international films to watch in its visual room. On the ground floor, there is also a workshop where various art courses are regularly organised.